Suez Water will be making a presentation to the City Council on leak detection technology that could prevent major water main breaks by detecting leaks early on. The proposed $2.5 million investment in the technology is part of the proposed amended agreement with Suez Water which includes a total of $31 million in infrastructure investments. The Council agenda will also include a resolution to adopt the proposed agreement as well as an ordinance to mandate that funds received through the agreement be dedicated towards water main system improvements. 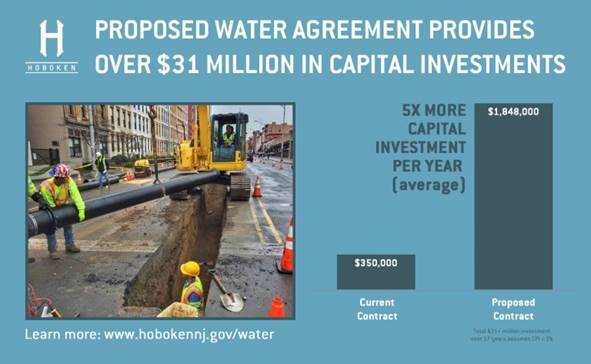 Hoboken’s existing agreement with Suez Water which extends through 2024 only requires Suez to make $350,000 per year in capital investments in the water system – less than the amount needed just to make emergency repairs. Under the existing agreement, the City is responsible for repairs exceeding $350,000 per year as well as excess bulk water costs as of 2014. The City’s current liability to Suez under the existing agreement is $8.35 million and is estimated to total $17.8 million through 2024. The proposed agreement would extend the contract through 2034, forgive the existing liability, and provide an estimated $31 million investment in Hoboken’s water system. The proposed agreement would shift bulk water and capital repair costs from the taxpayer to the ratepayer. The proposed agreement was introduced to the City Council on July 11th, presented and discussed at City council and subcommittee meetings, and the following provides the second set of responses to Council members’ questions regarding the proposed agreement: www.hobokennj.gov/docs/Suez-Agreement-QA.pdf. Talking Ed Note: MSV recently changed its longstanding policy of not commenting under official City of Hoboken releases. Mayor's Zimmer's request to the City Council is Dead-on-Arrival. Earlier today three members of the City Council: City Council President Jen Giattino, Peter Cunningham and Tiffanie Fisher expressed reservations asking further financial analysis be provided to the council. MSV sources confirm Councilman Ravi Bhalla who was challenged for a potential conflict by Councilman Mike DeFusco at the earlier council meeting where a Suez presentation was made will not be able to participate in the discussion and vote. Councilman Bhalla is a law partner at Florio, Perucci and Suez is a client of the firm. Sources confirm Councilman Bhalla has recused himself. Corporation Counsel at the earlier counsel meeting said there would be no legal analysis on a conflict of interest on the matter of Suez and Councilman Ravi Bhalla's participation "on the fly" during the meeting. Apparently, some legal analysis by members not conflicted in the legal matter, possibly an outside State agency provided guidance to the City of Hoboken. The City Council would consider the Suez contract before eight participating members. It's highly unlikely there are five members willing to entertain a vote approving the mayor's request next Wednesday. It's far more likely a discussion will be held and/or no vote contemplated or a motion to table. Whatever action the City Council chooses, Councilman Ravi Bhalla will not be participating.